Our Annual Reports give an insight into the progress of our mission and support for each year. 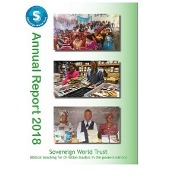 You can now read our 2018 Annual Report, which contains news from those we are supporting around the world, together with our financial summary, and details on our fundraising and mailing activities. We also include an interview with author, Hugh Hill (by Trust Director, Chris Moffett), together with updates on translation, publishing and pre-loved books. Please contact us directly for further information. we have a separate site.